To listen to Brian Friedman’s piece about Esplanade Studios on WWNO radio, click here. The first thing one notices inside the control room at Esplanade Studios is the mixing board. Thousands of dials, buttons, and gauges line a surface about the size of a canoe. 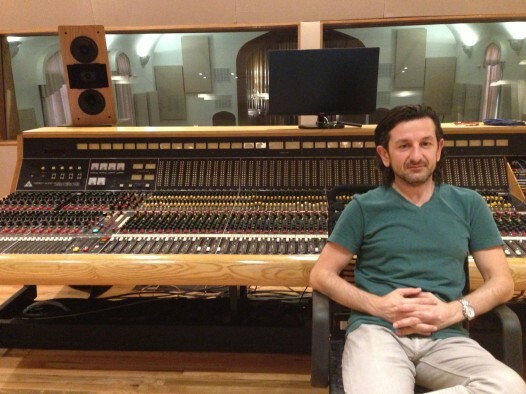 Esplanade Studios founder and chief engineer Misha Kachkachishvili in front of the Trident TSM mixing board. And not surprisingly, this board has some history. The Trident TSM console, built in the 1970’s, once resided at A and M Studios, in Los Angeles, and Prairie Sound Recording, in the Bay Area. It was used to record artists like Barbara Streisand, The Police, Tom Waits and, the best selling single of all-time, ‘We are The World’. “So this board has seen lots of great music and it’ll see more again, hopefully,” said Misha Kachkachishvili, owner and chief engineer at Esplanade, which opened its doors in June. The Trident, like nearly everything on the premises, has undergone a lengthy, painstaking restoration. From 1921 until the Sunday before Hurricane Katrina, the gothic revival church on Esplanade Avenue in the Treme was home to the Third Presbyterian congregation. Katrina flooded the building, shattered its windows and scattered its congregation – forcing them to sell. The church would then sit on the market for five years, vacant and decaying. Enter Kachkachishvili, a native of the Republic of Georgia who first came to America in 1994 as part of an exchange between Loyola University and the Georgian Conservatory. Kachkachishvili would work at a couple different sound studios in New Orleans over the years, but he was always keeping an eye out for old churches and firehouses with the high ceilings and space necessary for larger orchestras. The answer, it turned out, had been hiding in plain sight. “I live literally one block away,” he said. “I just kept driving and finally decided to approach the real estate agent. So with the state’s film tax credit program at his back, Kachkachishvili bought the property and immediately got to work. The stained glass windows int he control room — the former choir loft — are a unique feature at Esplanade. Studio C is a private studio for film and television composer Jay Weigel, who is fresh from creating music for Will Ferrell’s ‘The Campaign’ as well as for the Tyler Perry Medea Christmas movie. While film production in New Orleans has exploded since the inception of the tax credit program in 2002, sound production has lagged because of a lack of sufficient space, leaving most productions to outsource most of their audio post-production work out of town. 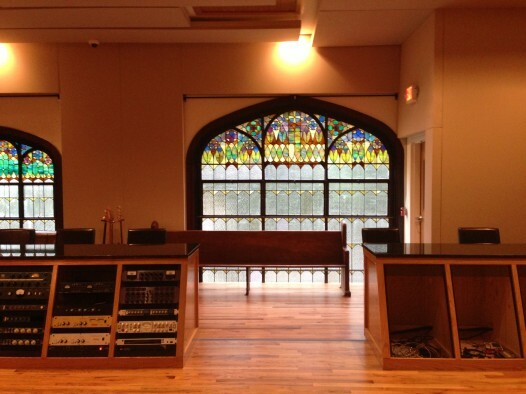 Studio A, the 3400 square foot main recording room at the heart of the church’s former sanctuary, is dominated by a massive pipe organ that was donated by Andrew Carnegie in the 1920’s – one of just two the philanthropist gave to the city. And while it’s not functioning right now, Kachkachishvili expects to have it back in working order next year. In addition to the studios, there is a guest room for artists’ residence, as well as a full kitchen, with a lounge, four bathrooms and two showers, allowing musicians to virtually live at the studio while in a creative groove. “I’m convinced that once the rock and roll guys see this facility, they’ll be down here,” said Weigel, “because what an amazing place for them to be able to hang out, sleep, record, eat, do all the things they love to do while they make a record over a period of a month and potentially never have to really have to leave the place except to just relax. Kachkachishvili’s work on Esplanade Studios continues. Still under construction is an additional three thousand square foot downstairs space for special recording projects, including live or private concerts. And while all of the city’s musicians stand to benefit from the increased opportunities offered by Esplanade, classical musicians — traditionally the most vulnerable in a city dominated by jazz and funk — could be particularly helped. As a result, Kachkachishvili says that many of these classical musicians leave New Orleans after just a year or two. “It’s important to keep those players here,” he said. “They’re phenomenal players and they’re form all around the country, and having for them the space that can guarantee them some work, that can just keep everything going it’s just very, very important. For more on Esplanade Studios, visit www.esplanadestudios.com or their Facebook page. To learn more about the film industry in New Orleans, visit wwno.org.